Welcome to the ultimate source of authentic collection of designer salwar suits and women's attires that sets the world of the fashion houses in the market. Since our establishment in the year 1991, "K. Nandlal Sons" has been into the business of designing, fabrication and supplying aesthetically pleasing range of suits. Due to the expertise of our team and par excellence of our mentors Mr. Manoj Talreja and Mr. Mayur Talreja, we have been able to bring out our unique collection of numerous designer and comfortably fashionable range of Salwar Suits. Our trading brands are Khwaish, Khushika. With our abilities to create ensembles that are enchanting and attractive enough to be liked by the wearers and onlookers, we have emerged as one of the most successful name in this arena. Further, our expertise primarily lies in the understanding the demands of the ongoing trends and what the customers want that has lead us win a solidified customer base. Our range is made of approved fabric materials that is rich in quality. With our company's head high policies, we are committed to provide our customers with only those creations that are high in terms of quality, style quotient, vivacious looks, subtle touch and trendy appeal. Last but not the least, clients are exposed to the dress materials with us that are available in various sizes, colors, designs, embroidery works, cotton, silk, chiffon and chicken dress materials and that too in viably good prices. Hence, our ladies garments represent Modern India that is grown with our rich heritage and culture and in amalgamation of modern choices. Trading of Fashion Salwar Kameez, Embroidered Ladies etc. The experts at our premise are proficient in matching the customized demands of the clients. Throughout producing these, we also make sure that all the particular details provided by the clients are completely taken care of and integrated in our ultimate array of ladies garments. Most prominently, the entire process is done devoid of negotiating on the quality and also offering these at very competitive prices. At our premise, we have the team of employees who are very much pleasant and dedicated towards their work. With the aid of our veteran personnel, we are able to offer a fashionable range of suits as per the precise demands of our patrons. Their passion to work in a group plays a vital role in the general growth and achievement of company. This was a greatest assistance that helped us in becoming one of the well-known organizations in garment and fashion Industries. They incessantly work just before developing pioneering designs and exceptional patterns thereby, providing clients with both modern and traditional range of garments. 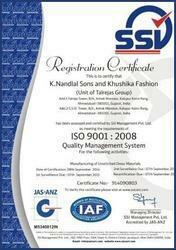 Offering of beautifully designed range of garments has enabled us to attain a notch position in the textile industry. Being a quality oriented company; we pride ourselves in providing the premium quality garments according to the set quality standards. At our sophisticated testing unit, every product is thoroughly examined on determined parameters.